Caption: Councillor Lucinda Yeadon with Dr Adam Beaumont, CEO of aql. More people across Leeds will be able to surf the web for free after the council announced the award of a new Wi-Fi contract. 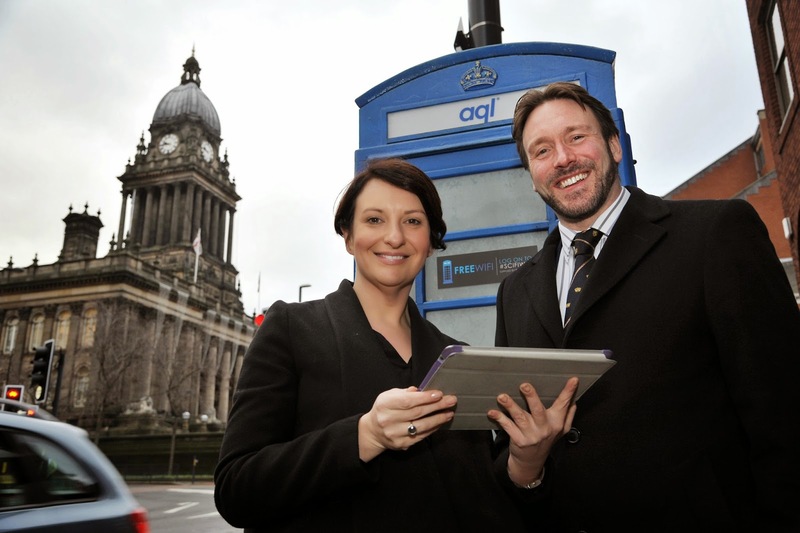 Leeds-based company aql have been contracted to deploy free Wi-Fi in additional parts of the city at no cost in a bid to get even more local residents online. The announcement comes after the council recently began installing free Wi-Fi in more than 100 council buildings, including libraries, museums and leisure centres, under the government-funded Super Connected Cities programme. Free Wi-Fi is also already available on Millennium Square and Briggate under an existing arrangement, with more than 30,000 people registering over the last two years. The new contract with aql will start early this year in parts of the city yet to be finalised, but will aim to reach areas where internet connectivity is poor or where people are unable to afford internet subscriptions. “Our ambition is for Leeds to be a modern, digitally-focussed city where residents are fully equipped to take advantage of all the opportunities that the internet provides. “In order for us to achieve that, it’s absolutely crucial that as many residents as possible are able to access the internet, no matter where in the city they live. “This new contract will hopefully go some way to helping bridge the ‘digital divide’ by potentially focussing on some of the areas of deprivation and current poor connectivity. "As the world becomes increasingly dependent on the internet it is vital we do all we can to ensure everyone in our city has access to the benefits the internet can provide. “This new contract will allow even more residents to access a free Wi-Fi connection, helping them to find jobs, shop and search for things to do. Aql already have a presence in Leeds, with their old style blue telephone boxes providing free Wi-Fi on the Headrow and in other city locations. The new contract will see most of the new Wi-Fi devices mounted on street lighting columns. “Over the last decade, aql put Leeds on the 'internet map' and our datacentres are home to the main internet hubs for the region. “This places aql in an ideal and unique position to be able to deliver high speed internet and international access to the region, backed up by the many Terabits of capacity within our facilities. "We're keen to roll out high speed internet access to areas of most need."